Looking for free, profesionally-read audio books from Audible.com? Here's a great, no-strings-attached deal. 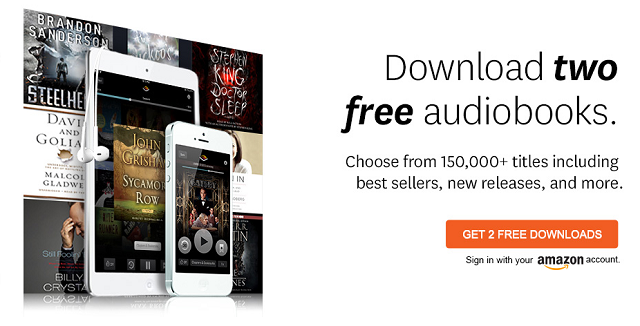 If you start a 30 day free trial with Audible.com (click here or the banner above), you can download two free audio books of your choice. They have over 180,000 books to choose from, which will play on almost any portable device or on your computer itself. You can even get courses from The Great Courses through Audible. Plus Harry Potter books. If you remain a subscriber to Audible.com's service after the 30-day free trial, you will get 1 new audiobook per month and pay $14.95/month. At the end of your free trial, you can opt out of the program and still keep the books. Or you can stay with this valuable program, as I have, and keep enriching yourself whenever you want. To get started, click right here. FYI: The web site Audiobooks.com (another provider of audio books) also offers a free trial program that lets you download a free audio book. Get details on that here.